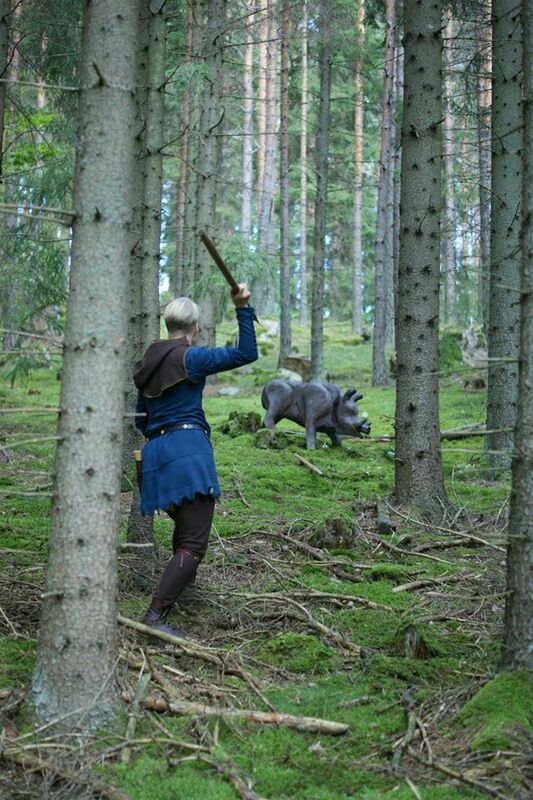 The Manuscript Challenge: A boar hunters outfit. 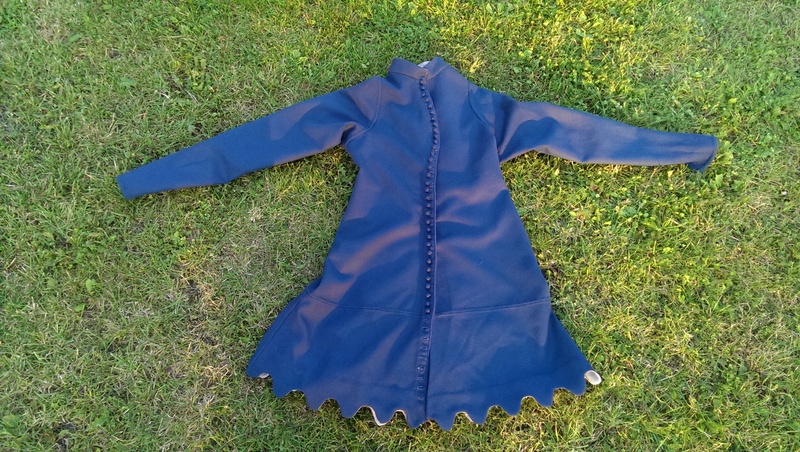 This post is about the making of my new outfit, my answer to The Manuscript Challenge. 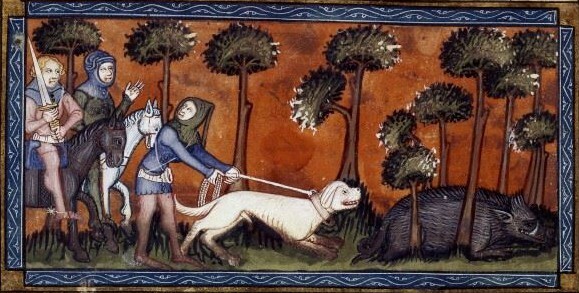 I’ve done an interpretation of the dog-handler in a boar hunting scene from “Les livres du roi Modus et de la reine Ratio”, the King Modus manuscript from ca 1370. I admit that this outfit is well within my comfort zone and not very different from what I already have in terms of gear. 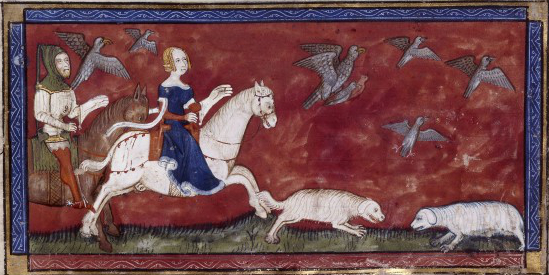 But I like how it looks, it fills a gap in my wardrobe and I thought that it could be fun to interpret something exactly from a picture in my favourite medieval hunting book. In this way I can be sure that what I’m wearing are things that are meant to go together and hopefully well suitable for the activity depicted. 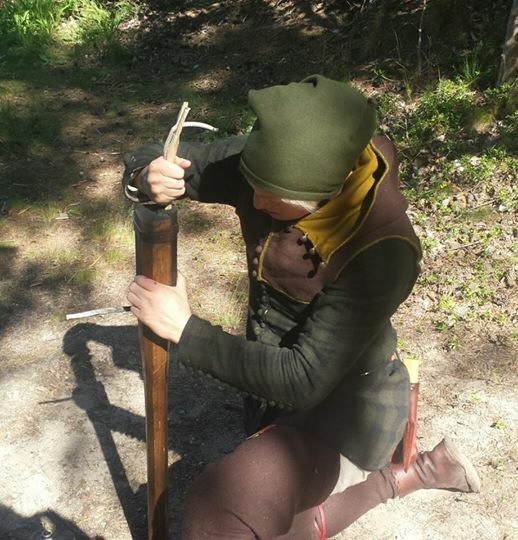 As you can see, this hunter is wearing a tight liripipe hood (the making of it is described in detail here) and matching hoses with fashionably pointy toes. 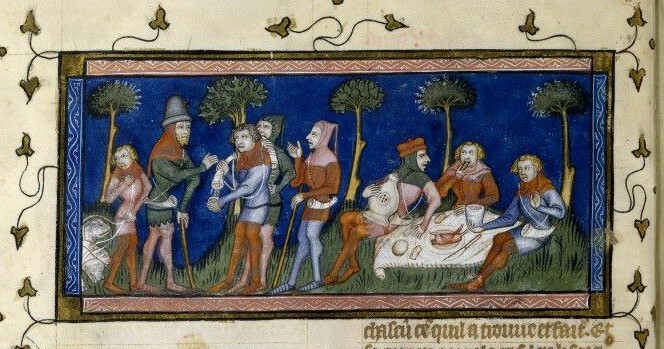 Like many hunters on foot during this period, he is not wearing any shoes. 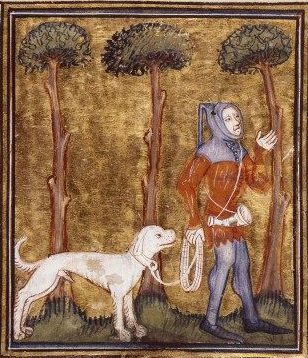 That might lead us to suspect the hoses being soled with leather. 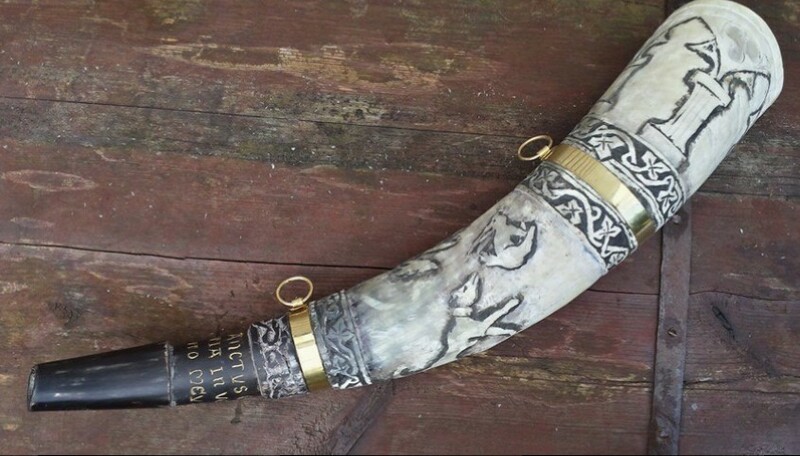 Tiny stripes on the horn suggest that it could be carved decoratively and the thin baldric is crossed below the waist. He is also wearing a thin black belt. 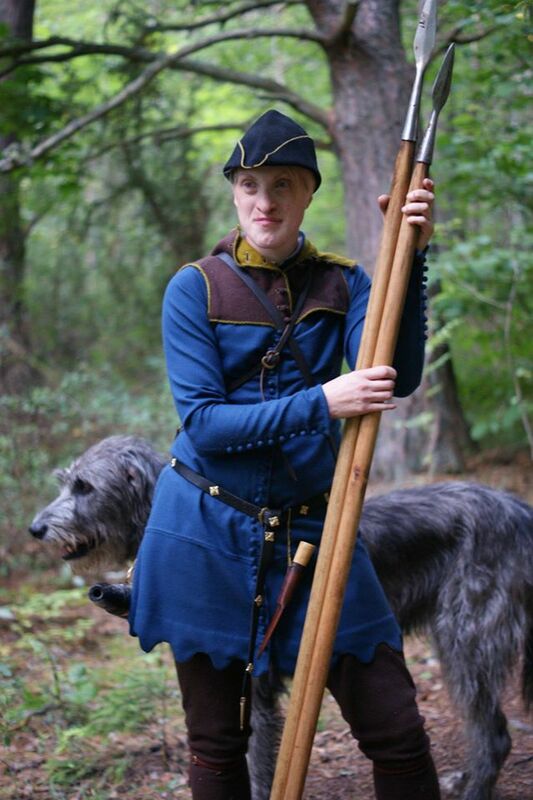 The hunters blue kirtle is very well fitted and buttons down the front, probably also on the sleeves. It has a generous cut over the chest to achieve the masculine Gothic ideal, a muscular “dove-chest” contrasting the narrow waist and straight fit over the hips. 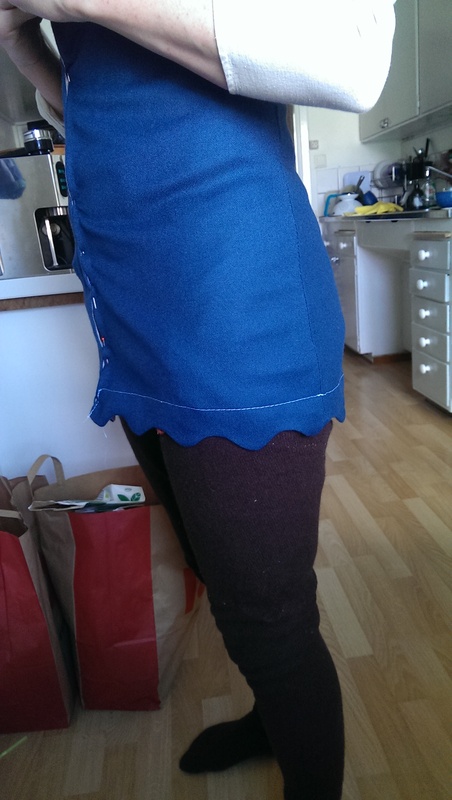 The kirtle on my manuscript picture reaches to mid thigh where it ends with a softly dagged edge. To short and to tight! I had to insert a gore in the middle back to expand the fit over the hips. The first dagged edge was sacrificed. 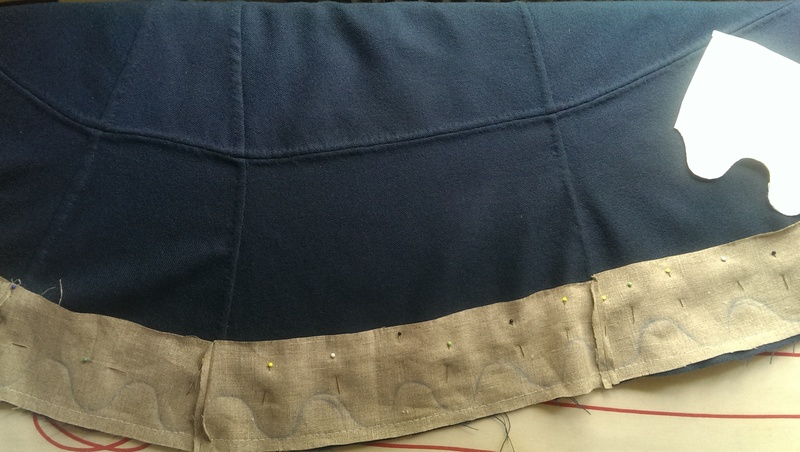 I cut it off so that I could add an extra piece of fabric, following the lines of the pattern and lengthening the whole garment about 25 cm. 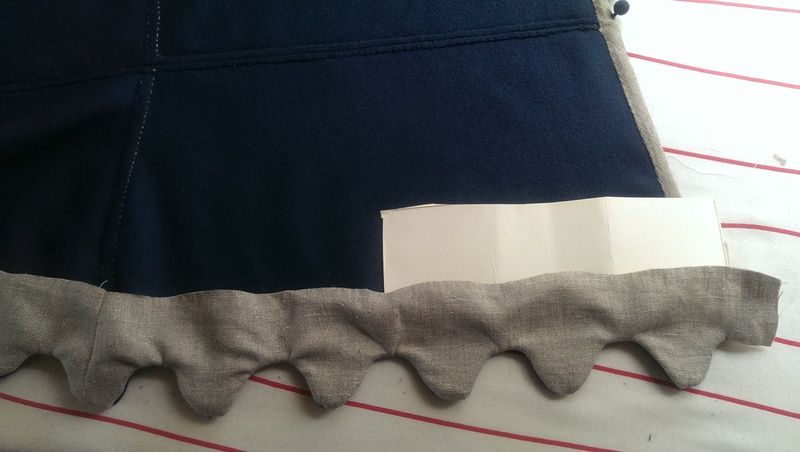 When that was done, I had to re-do the dagged edge, now wider. All this was about three extra days of work, re-doing things I knew I should have done from the start. In the end I had a kirtle that was a slight bit longer than I had planned in the first place, but it looked very much like my original picture. It is bitter and tedious work, mending up a mess you’ve made yourself. 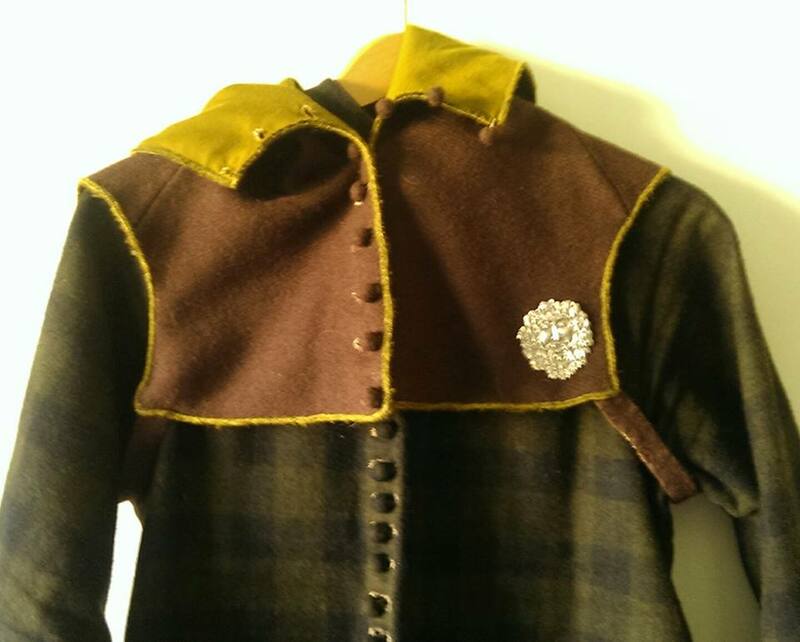 But once I got the length right, I celebrated my victory by turning my attention to things I actually enjoy doing: details like buttons, buttonholes and pretty edges. 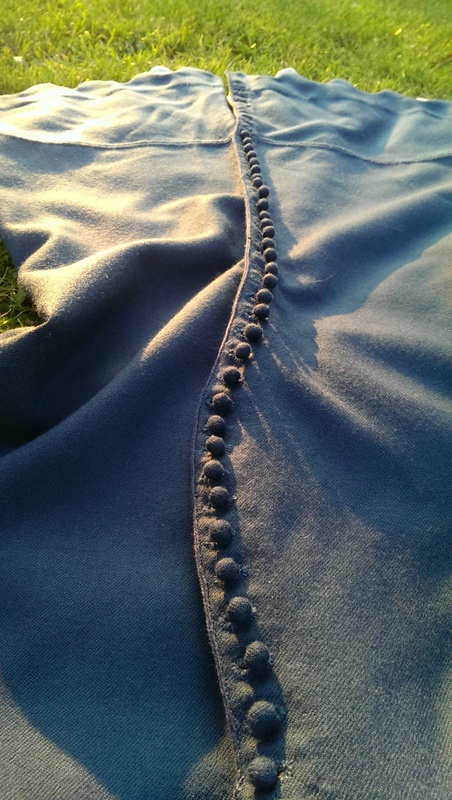 The thin woad blue twill was a dream to work with and I hand stitched everything with silk or waxed linnen thread. Curvy cut over the chest and a pretty tablet woven edge in silk. 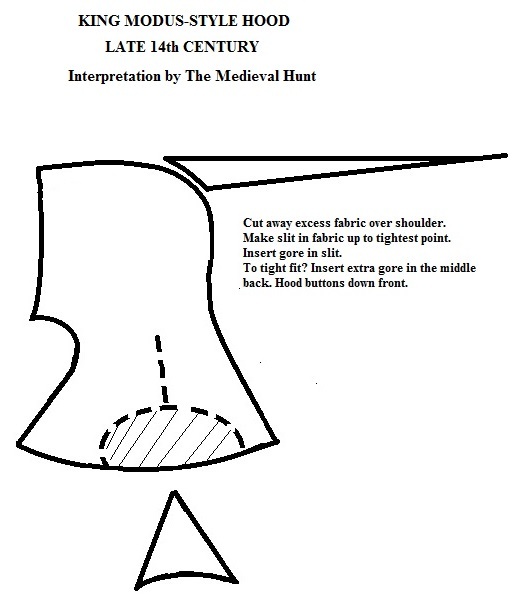 The kirtle is deliberately cut with a light curve over the chest and has medium size “grand assiette”-sleeves with a gore inserted over the shoulder in the back. This allows for maximum freedom of movement in arms and shoulders but still gives a nice tight fit. I also added a small standing collar because I like how it looks. 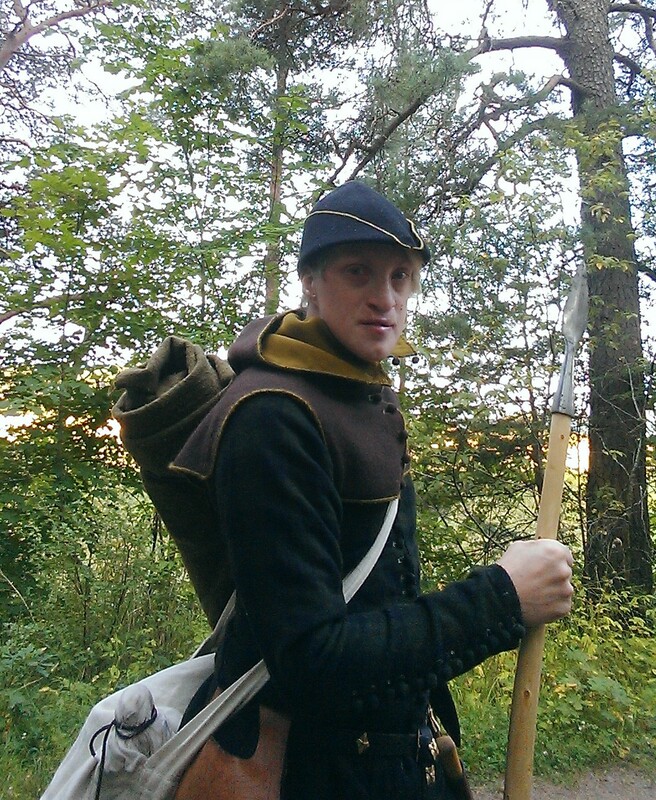 It doesn’t show on my manuscript-picture because of the hood, but low collars like this one are seen on other pictures in King Modus. I finished the whole kit just in time for an event this past weekend. 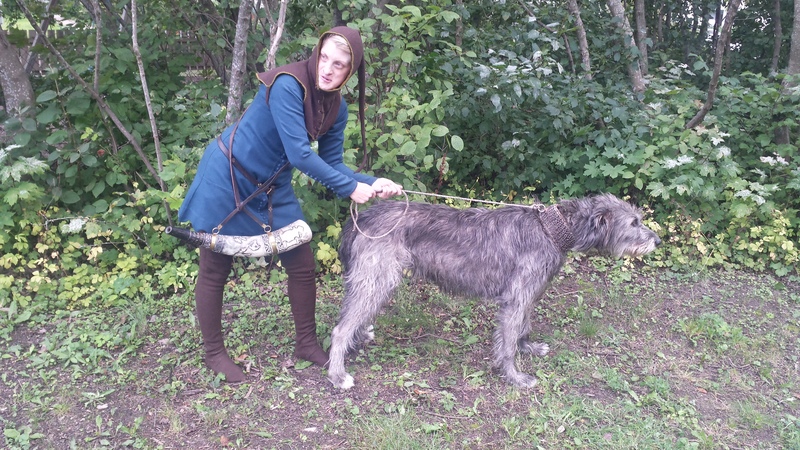 I’m so happy with how it turned out, but also surprised by the princely look it gives me. 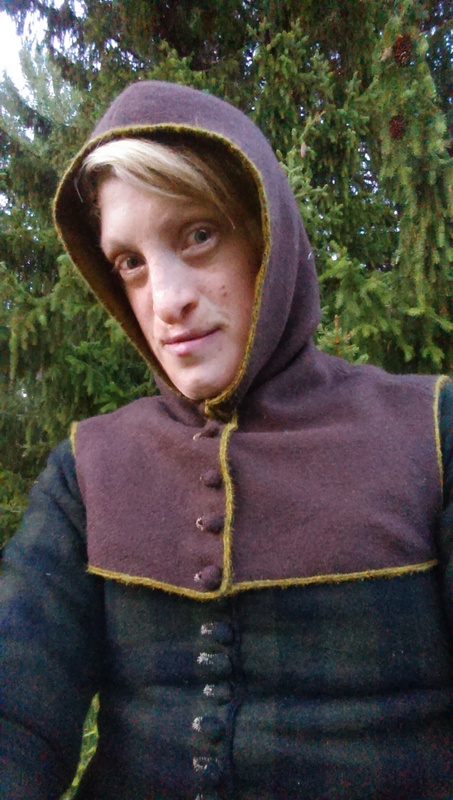 The kirtle look so much more glamorous than I expected! But as I’ve worn and torn it during this weekends adventures, it starts to feel more like me. 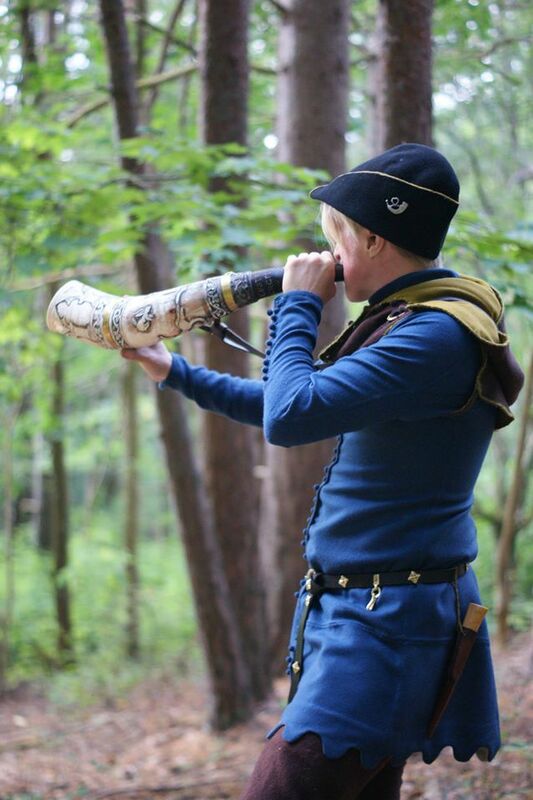 Johan carved the horn that I carried with the rest of the outfit. I love how it is decorated with winding bands of wine leafs, happy hares and playful greyhounds. It has got a characteristic smell of tar, beeswax and gunpowder that I wouldn’t mind having as a personal signature scent. So this is it for my first manuscript challenge. 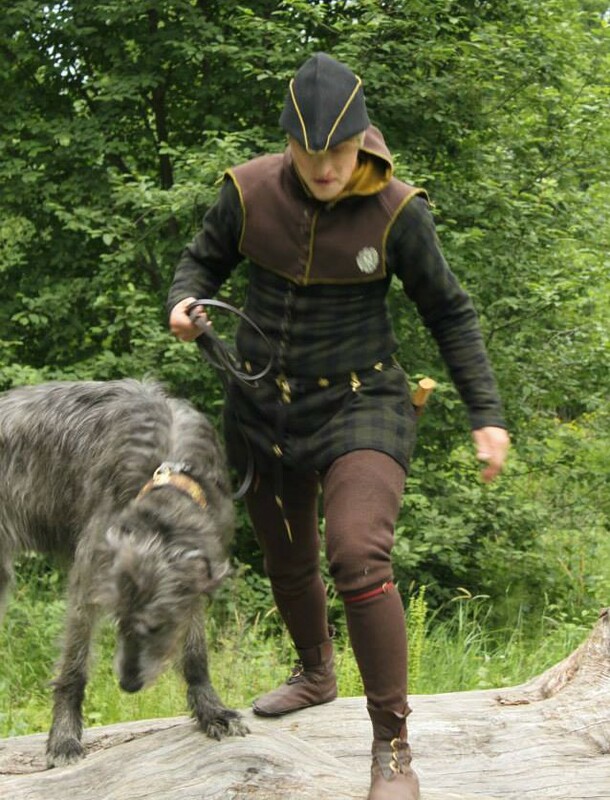 It was fun and intense to make the outfit, all hand stitched and with extreme attention to every detail. 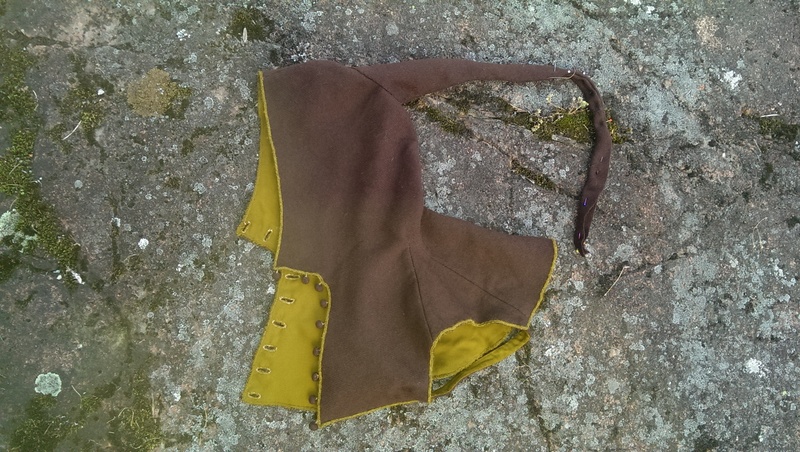 Slightly challenging to correct my mistakes by enlarging the pattern for the kirtle at such a late stage and lots of extra work, but not very difficult. 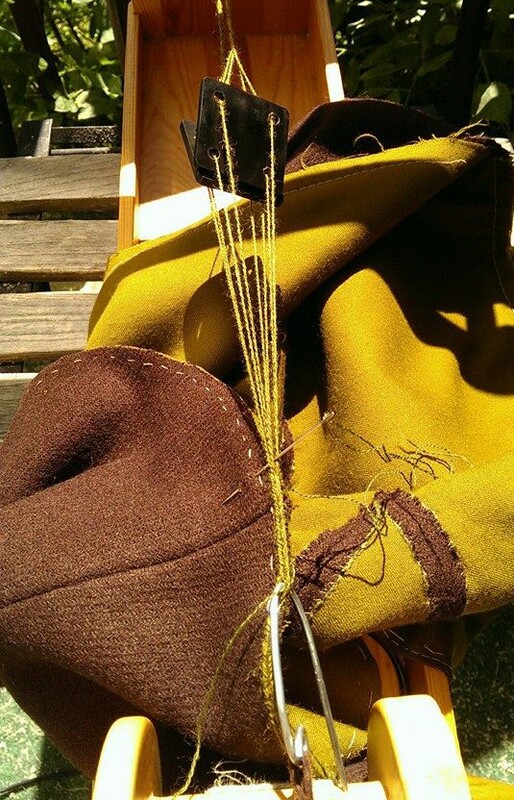 Material needed: Blue twill wool, ca 1,70 meters, plus scraps of unbleached linnen. 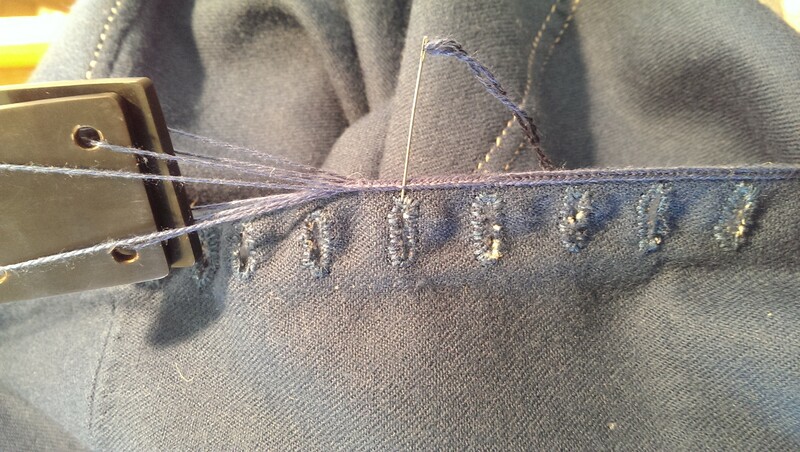 Sewing thread in silk and linnen, beeswax. The 63 buttons was made of leftover cloth. I had all the material at home when I started.